A team of scientists has calculated the risk for a worst-case scenario upper limit for sea level rise within this century, revealing that the sea level could rise 1.8 meters. The climate is getting warmer, the ice sheets are melting and sea levels are rising – but how much? The report of the UN’s Intergovernmental Panel on Climate Change (IPCC) in 2013 was based on the best available estimates of future sea levels, but the panel was not able to come up with an upper limit for sea level rise within this century. Now researchers from the Niels Bohr Institute and their colleagues have calculated the risk for a worst-case scenario. The results indicate that at worst, the sea level would rise a maximum of 1.8 meters. The results are published in the scientific journal Environmental Research Letters. 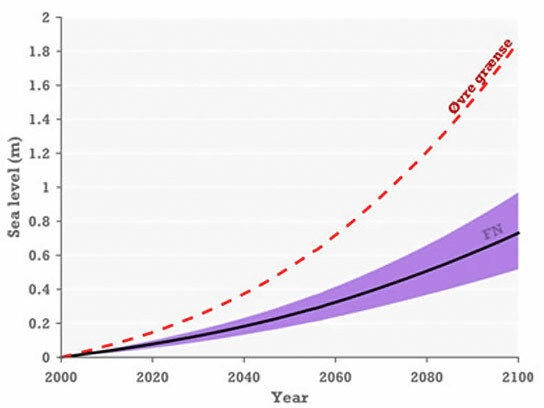 1 Comment on "Worst-Case Scenario 2100 Sea Level Projections"
The most salient question the author might ask himself is in what decade of the 21st century he expects to see one tenth of the rise this model predicts? The same question applies to the even scarier expectations true believers have rised over the past three decades. If the future is ever to arrive it has to start somewhere.